All of these preconditions have been met, in some sense. The prisoner release was approved at great political cost for PM Netanyahu, an unpublicized limitation on construction if not a complete freeze seems to be in effect, and Kerry has made a promise to the Palestinians that the basis of the negotiations will be the so-called pre-1967 lines (the State Department denied this in the typical careful language that indicates that it is in fact true). What does it mean that the negotiations will be ‘based’ on pre-1967 lines, or more precisely, the 1949 armistice lines? The position of the Obama Administration is that land outside the Green Line in Judea and Samaria (excluding Jerusalem, which is another story) belongs, by default, to the Palestinians. Thus, any territory kept by Israel in a peace agreement would require compensation to the Arabs in the form of land swaps from areas that are within the Green Line. 8. The provisions of this article shall not be interpreted as prejudicing, in any sense, an ultimate political settlement between the Parties to this Agreement. 9. The Armistice Demarcation Lines defined in articles V and VI of this Agreement are agreed upon by the Parties without prejudice to future territorial settlements or boundary lines or to claims of either Party relating thereto. UNSC 242 called for “secure and recognized boundaries,” and Oslo made no mention of the 1949 lines. A fair starting position, taking account of international law and precedent, would be to treat Judea and Samaria as disputed territory to which the Jews have at least as much (and possibly more) rights than the Arabs, and develop a plan to achieve “secure and recognized boundaries” — with an emphasis on ‘secure’, given recent experience with Gaza. Instead, the US chose to tilt sharply toward the Arabs. In effect, the administration is acting as though the illegal Jordanian invasion and occupation of Judea and Samaria in 1948, and the ethnic cleansing of its Jewish population, nullified Jewish rights to the area and converted it into ‘Arab land’! As I wrote yesterday, Abbas doesn’t see the need to make any concessions at all, because he believes that ultimately the UN will give him a state without requiring him to recognize Israel as a Jewish state, give up his unprecedented demand for ‘right of return’, or even accept a ‘two states for two peoples’ formula. Kerry has not accomplished anything special, other than proving yet again that the Arabs are prepared to pocket what they can get from Israel without giving anything up. And it is very hard to imagine the negotiations succeeding. Here is an article by Jeffrey Goldberg, not a right-winger by any means, which explains why. What do Kerry and Obama know that we don’t? If someone can come up with an answer other than that they expect the talks to fail and then will be free to let the PLO go to the UN, please let me know. What does the Obama administration think it will get out of this? We know what the Palestinians want: They hope to see Israel forced to stop construction outside of the Green Line, while they push forward with EU-funded projects to create facts on the ground in Israeli-administered Area C. They hope to make it impossible for Israel to back away from the idea that the 1949 armistice lines are in fact the boundaries of ‘Palestinian land’, and not mere accidents of history. They want to further cement their narrative about history and international law, including fantastic conceptions like ‘right of return’ in the world’s — and America’s — consciousness. They have already gained agreement to the release of many convicted murderers, a humiliating loss of face for Israel and a huge propaganda victory for them. We also know what Israel wants: To avoid an open break with the Obama Administration at a time of extreme peril for the Jewish state. A confrontation with Iran — or the lack of one, equally dangerous — is certain within the next year. Hizballah’s missiles and Iran’s nuclear program will not go away by themselves. While it would be dreaming to expect the US to take real action against Iran, it is essential to maintain at least nominal American support for Israel’s actions. In Israel, only the extreme Left, for whom a complete removal of Jews from the territories is literally more important than the survival of a Jewish state, thinks that it would be a good thing for Israel to sign an agreement with the PLO today. It is impossible to imagine that these talks will succeed (here are 22 good reasons why not). But nevertheless, the administration pushes on. Why? Note that I said “Palestinian cause,” not the cause of Israeli-Palestinian peace. The difference is that although he pays lip service to Israeli security, it is clear that he gives it a very low priority compared to Palestinian sovereignty. It is impossible to know if he is actually hostile to the Jewish state, but at best he seems to think that its security will take care of itself, and focuses on the Palestinian side. In his first term, Obama tried to get negotiations going on very similar principles. But he made some tactical mistakes — primarily, not coordinating his plans with the Palestinians in advance — and was made to look foolish by Netanyahu. He backed down. At the time, many pro-Israel people argued that a second-term president would have less to lose — and will have learned from his first-term mistakes. And indeed, this seems to be the case. Now, less than a year into his second term, the other shoe is finally dropping. Obama now has his team in place — a team that (despite disingenuous statements made during confirmation proceedings) is far more anti-Israel than his first-term people. Kerry, Hagel, Power, Indyk — all are much closer to the Palestinian point of view, less concerned with Israel’s security, than their predecessors. I think that the administration understands that the talks will not succeed (let’s face it, anyone with half a brain understands this). As Barry Rubin argues, the Palestinians believe that they will get everything they want by international pressure, legitimized and enforced by UN — this time the Security Council — action. So they will make no concessions. The talks will go nowhere, except insofar as Israel will be made to show good faith — this is the same strategy used in so many con games, by the way — with giveaways like the prisoner release. Following Rubin’s argument, then the US will be able to say that it has tried its best, but [insert how it is Israel’s fault here]. Therefore, it can and will abandon the position it has taken for decades, that the question of Palestinian sovereignty, borders, Jerusalem, etc. must be settled between the parties. It will agree that the UN, the International Court of Justice, etc. may decide the issues. And then the US will acquiesce in Palestine’s unilateral independence. Perhaps UN Ambassador Samantha Power will be one of the first to announce her nation’s recognition of the new state. This is the sound of Barack Obama dropping the other shoe. 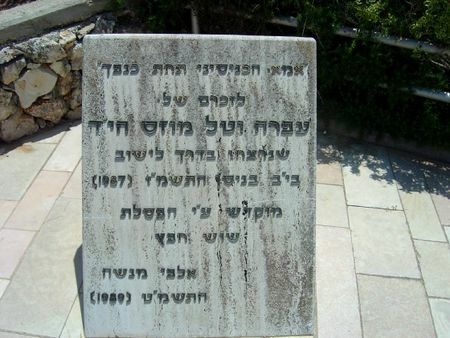 Memorial to Ofra and Tal Moses, burned to death in 1987 when Mohammed Dawd threw a firebomb into their car. Dawd is scheduled to go free in the upcoming prisoner release. What you did by agreeing to release more than 100 Arab prisoners who have been convicted of crimes including multiple murders is beyond wrong. It is shameful. It is disgusting. It is immoral. And it is stupid. I admit that I am shocked. I admired you. I thought that you learned Zionism from your father, and I know that you put your body on the line more than once for the state of Israel. So how could you do it? I understand that the murderous insects to be released are older, they will be carefully watched, etc. So maybe they will be unlikely to hurt anyone again (although maybe not). You have betrayed the families of the victims of these terrorists, who were shot, burned, stabbed, blown up and beaten to death. They believed that they had received justice, even if they would never get their loved ones back. Now they will watch their killers grin and make victory signs on television as our ‘peace partners’ celebrate their heroic return. For what? You have destroyed the honor of the Jewish people. You have put up a sign saying “an Arab is superior to a Jew, you can kill them and go free.” Nothing is more important in the Middle East than honor. Did you forget that you live in the Middle East? You handed Israel’s enemies a huge victory. For what? You have made a mockery of Israel’s justice system. Murder isn’t murder, if the perpetrator is a Palestinian. Multiple life sentences evaporate. For what? I strongly opposed the decision to release prisoners in return for Gilad Shalit, but at least you got Shalit back. What did you get for this? You certainly didn’t get the approval of Israel’s Jewish population, 84% of whom opposed the decision. No, what you got was the agreement of the illegitimate ‘President’ of the Palestinian Authority, who couldn’t deliver on a ‘peace’ agreement if he wanted to — which he doesn’t — to sit at the same table with you and make even more outrageous demands, demands for Israel’s capital, demands to flood the state with so-called ‘refugees’, demands to expel Jews from their homes, so he can establish a state dedicated to the destruction of yours and mine, and fill it with rocket launchers. You know in your heart that there will not be a real peace with the Palestinian Arabs in our time. So why did you throw away our honor to decorate Obama’s resumé? Oh, you got something from Obama too? Maybe he promised to bomb Iran’s centrifuges next week. I hope so, because if it was anything less, you sold yourself and your people far too cheaply. There are 40,000 to 50,000 individuals currently living in the Gaza Strip without ID cards recognized by Israel, and they have no official status anywhere else in the world. Some of them were born in the Gaza Strip but were never recognized as residents by Israel; some fled the Gaza Strip during the 1967 war, or left Gaza for various reasons after 1967 and returned later. A small number of these individuals were born in the Gaza Strip and have never left it, but do not have ID cards for various reasons. Other stateless individuals in the Gaza Strip are Palestinians from abroad who married Gaza residents, entered Gaza with visitor permits and remained after their permits expired. Individuals who live in the Gaza Strip without status and without an ID card or a passport of any country find it difficult to lead normal lives. They cannot leave the Gaza Strip for any reason, including studies, work, visiting family or pilgrimage to Mecca (al-Hajj). They cannot hold down jobs that require travel outside the Gaza Strip. Any stateless individuals in need of medical treatment not available in the Gaza Strip cannot go to Egypt to receive treatment and very rarely do they receive permission to enter Israel for this purpose. All of this is compounded by the constant overall sense of insecurity experienced by people who have no official status. This feeling is linked, among other things, to fear of an Israeli incursion into Gaza which may result in their deportation. On what planet must Israel be responsible for the IDs of Hamas-ruled Gaza Arabs? Should it also provide certificates of competence in rocket launching? Gaza is ruled by a gang whose basic premise is that genocide is good, and which has built up a huge stockpile of rockets to shoot at Israeli civilians when it’s ready for the next round. The status of Gaza is ‘interesting’ from a legal point of view, but it’s hard to make a case that it is occupied by Israel. For one thing, no Israelis, military, civilian or even dead bodies (which were disinterred when Israel withdrew in 2005) are in it. Yes, Israel controls its own border with Gaza (but not Gaza’s Egyptian border) and out of necessity blockades its waters and controls its airspace. That isn’t ‘occupation’, it’s self-defense. Issuing ID cards is exactly what an occupier might do, which is one reason Israel isn’t doing it. Gaza was invaded and occupied by Egypt in 1948, which ruled it in a brutal and exploitative manner. When Israel gained control in 1967, it tried to ameliorate some of the truly awful conditions, particularly for the refugees living in camps there, but in many cases was stymied by the UN and the PLO, which wanted the refugees as miserable and angry as possible. Palestinian voters elected a Hamas-led government in 2003, but the PLO did not allow it to take office because the Western donor nations that keep the Palestinian Authority alive refused to fund the frankly terrorist Hamas. Then in 2007, Hamas seized control of Gaza from the PA in a bloody military coup. 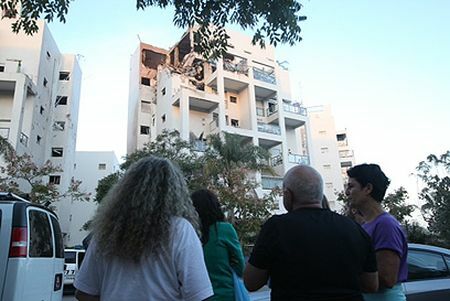 Israel, by the way, still provides water and electricity to Gaza, which recycles it in the form of rockets and mortar shells. Some years ago, a Hamas sniper shot and wounded an Israeli Electric company employee working on a tower near the border. The irony was palpable, but the electricity continued to flow. B’tselem, a radical Israeli NGO funded by the New Israel Fund, the EU and individual European states, wishes to keep up the pretense that Gaza is ‘occupied’ so that it can make Israel responsible for everything that happens to its residents. And of course also so it can blame Israel whenever the terrorism emanating from Gaza reaches a point that it has to hit back — as it did after Israel’s 2008-9 campaign against Hamas. B’tselem was the single largest contributor of the (almost entirely false) accusations of Israeli ‘war crimes’ that appeared in the tendentious Goldstone Report. In an attempt to resolve the plight of stateless individuals in the Gaza Strip, in January 2008, the Hamas government began issuing temporary internal ID cards to Gaza residents who are not listed in the Population Registry. This measure was implemented in order to help these individuals in leading their daily life within the Gaza Strip and enable them to do things like open a bank account, enroll children in school or acquire medical insurance. According to figures collected by the Ministry of Civil Affairs in Gaza, there are currently about 20,000 Palestinians in Gaza who hold these temporary ID cards. However, these cards are not valid at the crossings into Israel or at the Rafah border crossing to Egypt, currently managed by Hamas and Egypt. In other words, Hamas IDs can’t be used to permit terrorists to cross into Israel or Egypt (since the overthrow of Morsi, Hamas has been skirmishing with the Egyptian army). Are you surprised? It is long past time for the everyone to realize that the ‘plight’ of the Palestinian Arabs is entirely the making of their own leadership — al-Husseini, Arafat and Abbas, and also Hamas and other even more radical factions — as well as the leaders of the rest of the Arab world. And even the Palestinian Arabs themselves, who have overwhelmingly voted for the PLO and Hamas when given a chance, have shown that they support the rejectionist position that prioritizes the destruction of Israel over the welfare and even the lives of Palestinian Arabs. The truth does not remotely resemble this. A majority of Israelis know that the PA has little support from the residents of the areas that it controls and none at all in Gaza, where 40% of the Palestinian Arabs live. They also know that the security consequences of a withdrawal from the territories would be unacceptable, and that while the PLO is sincere about wanting to get Israel out of the territories, it is not sincere about making peace. The poll results mentioned in the story are based on questions like this: “Would you favor the establishment of a peaceful Palestinian state alongside Israel?” Of course a majority of Israelis would agree! Who doesn’t want peace? But at the same time, most realize that under today’s circumstances, an Israeli withdrawal would lead to anything but a peaceful state. They have the continuing example of Gaza, in case they forget what a sovereign Palestinian state is like. In addition, they know that the gaps between Israel and the PLO on such issues as refugees, Jerusalem, borders, etc. are as wide as ever — perhaps even wider than in 2000 or 2008, when an agreement could not be reached. They know that the PLO has preferred to get its way be manipulating the UN, the Europeans and the US, rather than in meaningful negotiations with Israel in which they might have to give something up. They know that the PLO has avoided talks for years by placing impossible preconditions on them. So they understand that talks are most likely only a way to pressure Israel to make concessions without much chance of success. And they know that the PLO has sponsored terrorism against Jewish civilians consistently since its beginnings, and that terrorism generally increases when negotiations are taking place. They know that the PA never lets up on its incitement, or on its glorification of the most vicious mass murdering terrorists as heroes. They know that many of the 118 prisoners that are about to be released as a good-will gesture to bring the Palestinians to the table have murdered Jews for political reasons, and that they will return home to hero’s welcomes. They will comprise a direct affront to the honor of Israel and the Jewish people, demonstrating that we are too weak to punish the murderers of our brothers, sisters and children. Recent bad ideas, like Oslo and the Gaza withdrawal, were implemented without public approval. 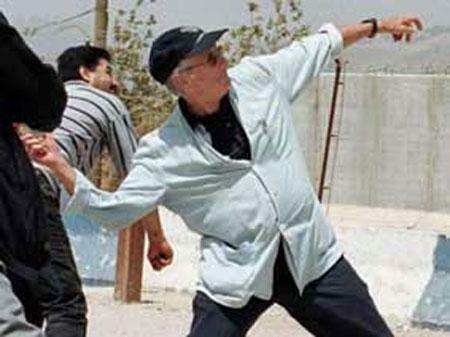 Oslo was dropped on Israelis after secret maneuvers by politicians who did not represent them, and after they elected a Prime Minister who opposed a Palestinian state (and who, even after Oslo, opposed withdrawing from much of the territories and opposed granting full sovereignty to the proposed Palestinian entity). In the case of Gaza, Ariel Sharon held a referendum among members of his own Likud party, 65% of whom rejected his plan — which he put into effect anyway, even after saying that he would respect the views of party members! If there were a referendum on any proposed agreement with the PA, these are the considerations that would be taken by ordinary Israelis who are not politicians, media personalities or academics. It is hard to imagine that an agreement like the ones that were rejected by the Arabs in 2000 and 2008 would stand a chance among the general public today. So I don’t think Netanyahu needs a referendum to ‘silence hard-liners’. Rather, I think he wants it as more ammunition to prevent the US from railroading Israel into an agreement that would prove disastrous.